For an SEO blogger, I am a pretty heavy publisher of YouTube videos. 99% of my weekly recaps contain a video that is 10 minutes or longer of me talking. If you have not subscribed specifically to the video, you can do so over here. You can listen to it on iTunes as a podcast or just watch the video on YouTube or on the web site - totally up to you. 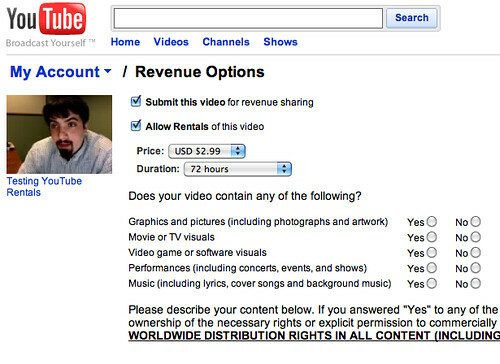 So when YouTube comes out with new ways to monetize the videos, I listen up. The enable revenue sharing feature that places AdSense video ads in your videos and pays you out via AdSense has been nice. 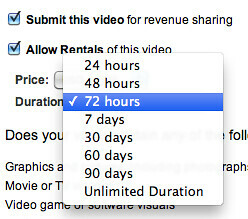 But now I spotted a new button in my videos list, "Enable Rental." Here is how that works. When I submitted my junky test video, it then labelled the video as "Video submitted for rental consideration." 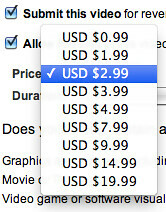 So it is currently free, but I do wonder how it will work if, that is a big if, they accept this video into their rental program. Previous story: Will My SEO Company End Up Competing With Me?